When Should You Pump Out Your Septic Tank? Your septic tank allows for safe wastewater disposal, so keeping it properly serviced is important for you and your tank’s health and safety. There are many signs that indicate it is time to pump out your septic tank; below we’ve highlighted the most common! Out of sight, out of mind: when you cannot see the wastewater, your septic system is working fine. That means, then, that pooling water in the lawn around your drain field indicates that it’s time to pump your septic tank. Standing water occurs when solid waste clogs your drain field pipes and allows wastewater to rise to your drain field. Look out for significant pools of water around your septic system and pump your tank as soon as possible! Your home’s drains may empty slowly due to clogs. If you try using safe unclogging techniques such as septic-safe drain cleaners, but still experience a problem, it may be time to pump your septic tank. Keep an eye on your sinks, showers, washing machines, and toilets for lazy drains that may show you that your septic tank is getting full. Once pumped, your drainage system should return to a normal, more spirited speed. Typically, black and smelly, sewage backup is probably the most evident sign that your septic tank is at capacity. Raw sewage backup is very possible without adherence to a regular pumping schedule. You can get sewage backup in your sinks, bathtubs, and toilets, calling for immediate professional assistance. Pro Tip: Look for sewer backups in your lowest drains first, like your basement! The nose knows: trust your sense of smell to guide you for when you need to pump your septic tank. Think of all of the water you put down the drain from activities like showering, dishwashing, laundry, and using the restroom; all of this water collects in your septic tank. Your septic system includes both solid and liquid waste and thus emits rank odors as it fills up. Pay attention to smells around your drain field and above your septic tank. In general, your septic tank should be pumped every three to five years, so if you can’t remember your last pumping, it probably means it’s long overdue. 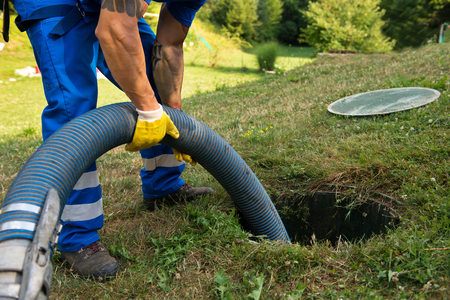 When you know your septic tank needs pumped out, turn to Freedom Septic Services for sewage treatment, septic cleaning, and septic pumping in Sykesville, MD. Give us a call at 410-795-2947 today to receive an estimate!